A great thing about my Nothing New Challenge is that it gives me an excuse to search out new places to go shopping, all of them far more interesting than my all-too-frequent Primark/H&M/Zara haunts. In the course of my quest, I've decided to share with you some little guides to the best places for charity and vintage shopping. This time, it's the lovely Sussex city Chichester. This turned out to be a very good place to get my challenge off to a good start, and I suspect that this may be due to the fact that the whole city seemed to be preparing for Glorious Goodwood Revival. In case you haven't heard of it, this is a weekend at Goodwood race course (near Chichester) celebrating all things vintage. Everyone is expected to don their best vintage fashions, so it makes sense that most places in Chichester are readying themselves to provide whatever the retro-seeking attendees are after. 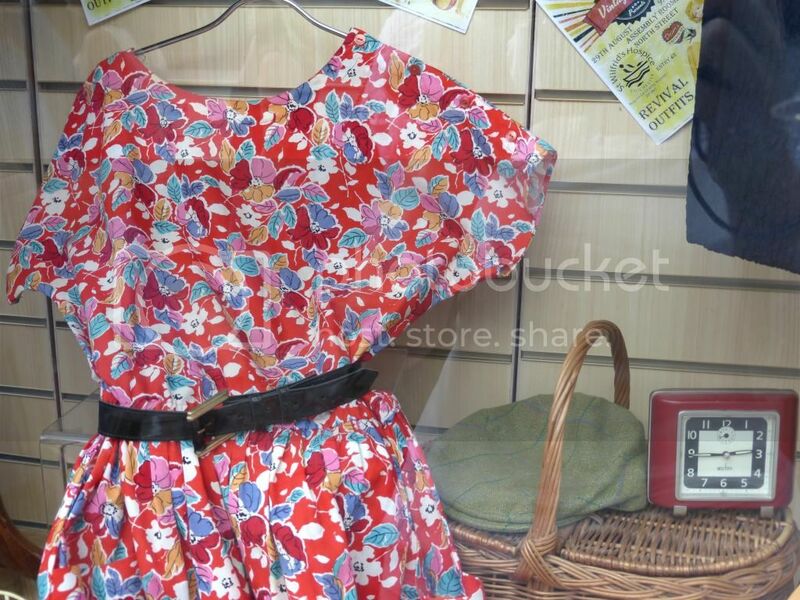 This mean that even the charity shops tended to have separate vintage corners and had placed their best 50s frocks enticingly in the windows. Now I have to confess something: I think I actually prefer charity shops to vintage shops. Sure, you are far less likely to find a 70s fur stole or a 20s flapper dress, but what you will find will be much cheaper. There are also so many treasures to be found in charity shops and, although they don't have quite the same atmosphere as vintage stores, with their warm 'shrine to the past' air, you may well find what you're after. In Chichester, you can hardly walk ten metres without coming across another charity shop. The selection includes Cancer Research, British heart Foundation, Oxfam, two branches of Barnardo's, and local charity St Wilfrid's Hospice. It amazed me that you could have so many second-hand stores in one place and for them to all be quite so well-stocked; perhaps the big ones are sent stock by head office. Cancer Research had a really good section at the back where they had gathered together big coats and clothes in dark tones to form an Autumn/Winter collection. Some of it was a bit pricier than you'd expect to pay in a charity store, but in fairness, I spotted a few brands (LK Bennet, Coach, etc.) which you would hand over a lot of money for if they were new, and these were all in pretty good condition. Most of these shops can be found on South Street, East Street or North Street. However, we found a particular lane which was just a second-hand paradise. 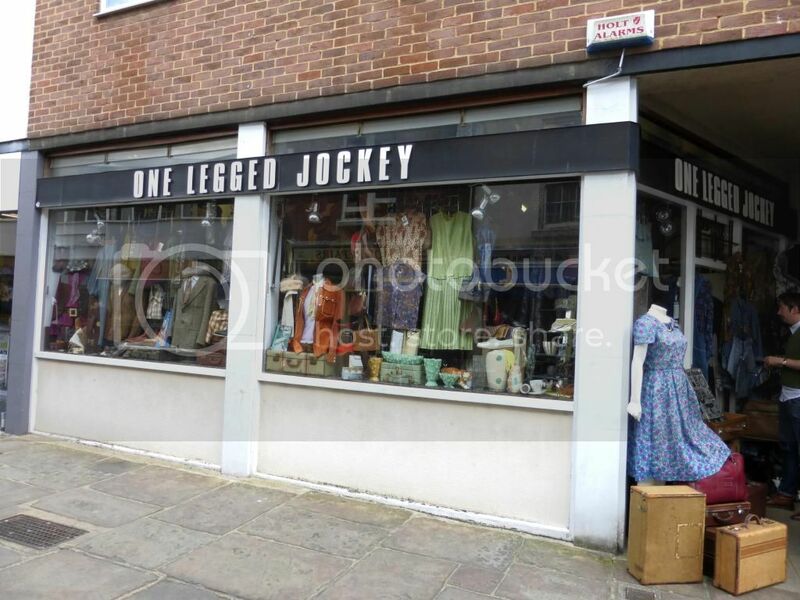 Crane Street, off North Street, not only has FIVE charity shops but also a vintage store called One Legged Jockey. I didn't buy anything this time round, though did really enjoy the feel of the emporium, with classic music playing and huge amounts of stock. It reminded me a little of my favourite vintage shop, Radio Days in London, where you can hardly move for leather jackets and ballgowns! I visited one other vintage store, Vintage@Chi. Another small shop, but with rather more room to move, this one had more the impression of catering to the woman who is after a special outfit for a party, whereas One Legged Jockey has a lot more everyday stuff. 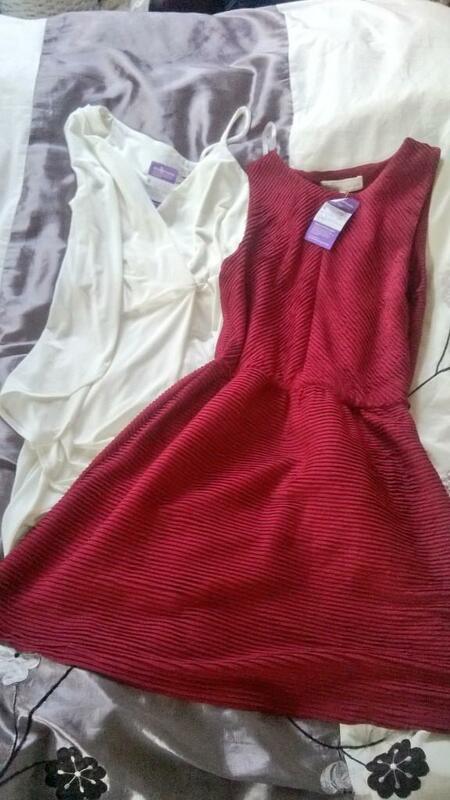 In the end, I bought two dresses, both from the same branch of Barnardo's. It would have been three, but a particularly cute tea-dress didn't fit me; that's one of the major drawbacks of second-hand - you can't just ask if they have the next size up. I'm sure I'll have the chance to show them off properly in future posts, but for now here's a shot from my Twitter, in which they are laid out like the spoils of war on my bed. I'd say that Chichester is the place to go if you're up for a good rummage through the charity rails, and have the patience to search for that hidden special piece. It's also worth visiting in the run-up to Glorious Goodwood, because everyone seems to have amped up their vintage/retro game. 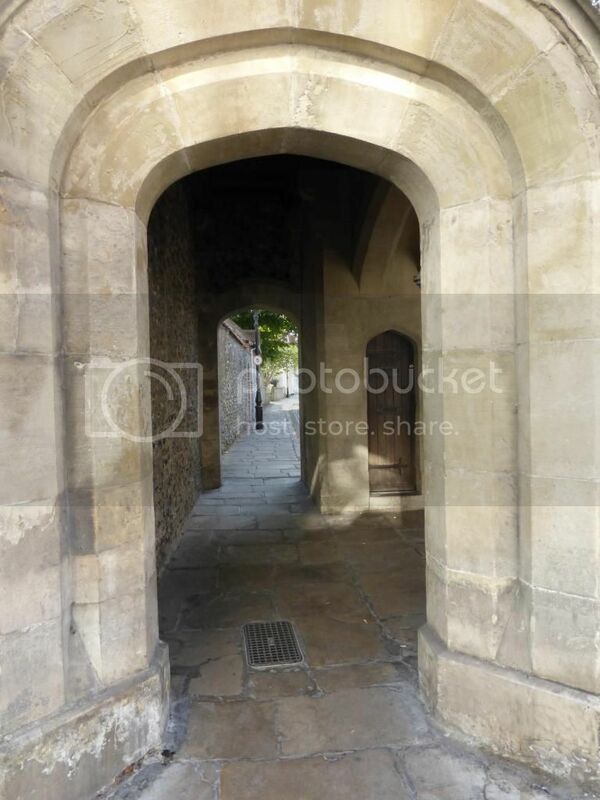 One other thing is that, if you're in Sussex, Chichester makes for a slightly subversive alternative to Brighton's famous lanes, and you can tie it in with a trip to the cathedral or Priory Park as well! I'll be posting more updates soon, so stay tuned! If you think there are any particular places I should go while I'm doing this challenge, let me know in the comments or on Twitter. In case you missed it, I've taken up the challenge of not buying any brand-new clothes; as in, I can buy 2nd-hand and vintage, but no designer or High Street. Last Saturday was my first big event to dress for: a friend's birthday party. This was not however an ordinary party, it was on a docked boat in Southampton, and the dress code was "tropical". Now I love dressing for parties. Whether they have a theme or not, I like hunting down that perfect outfit which I'll always recall as being "what I wore to 'X' event". But of course, my options were restricted this time. Ordinarily my first port of call would probably be ASOS, and indeed their customised adverts have become increasingly enticing now that I know I can't click on them. Instead, however, I headed for the charity shops. In a branch of Age UK, I stumbled across what may well be one of my favourite second-hand finds ever. It's a floaty maxi dress with an elasticated waist and a cutout section in the back. Originally from Papaya, I don't think this would have been particularly expensive when it was first on sale, but I'm pretty pleased with the price I got it for (£8.99). It's really easy to wear, and is perfect for taking on holiday because it doesn't crease at all! The dress has this subtle but also quite striking print, somewhat reminiscent of grasslands, which I thought made it fitting for the theme. On its own, however, it didn't look greatly tropical. I added some wedge sandals which I've had for years and originally bought from a British Heart Foundation shop! Then I went in search of some jewellery to brighten things up. After a little bit of rummaging in shops around town, I found a fun necklace with parrots and watermelons on it in the same branch of BHF. It was just £3.99. After that, things quickly came together. I added a couple of rings and bracelets from my collection, and the flower in my hair was actually cut from a plastic orchid I got from Ikea a while ago! To top it all off, we were presented with Hawaiian-style flower garlands once we got there. Perfect. So all in all, a grand total of just under £12 went into this outfit. Not bad at all, especially considering that the dress is so versatile I'm definitely going to wear it a lot. This is looking like a pretty auspicious start to the Nothing New Challenge. With Ed, whose shirt also came from a charity shop! But for now, enjoy the rest of this week's roundup. As ever, it's a fantastic collection. My particular favourites are Fierce in the City's 'How to wear backless clothes' (useful for me, since one of my new 2nd-hand purchases is a backless maxi dress) and Madame Ostrich's 'Let's Talk About Leather'. This week has been rough for a lot of us. The news is full of terrible things. Sometimes it's hard to focus when the world seems to be descending into chaos. But, at the end of the day, we all have to show up to our regular lives. Family, friends, work, creating the best life possible. Sometimes fashion seems, well, not the highest on the list of priorities, so sometimes you just have to return to the basics, the classics to work for you while you get your life on track. It's not all about the clothes. Fashion Moriarty: The "Nothing New Challenge"
It's summer, and I'm bored. Of course, there are productive things I could be doing, like actually reading The Faerie Queene, or getting a paper round, or starting up a small greetings card business. But typically, my mind has been wandering, and I've come up with a little project for myself. I've decided that I'm going to give up buying brand new clothes. By that, I mean anything straight from the High Street or online, anything newly-made and unworn. Shopping is by no means out though, as I'll be scouring vintage shops, markets, charity stores and several other places whenever I feel my wardrobe needs a refresh. Firstly, and most importantly, I am worried about the effect that fast fashion is having on our environment, our culture and our world in general. With the collapse of the Rana Plaza garment factory in Bangladesh just the latest in a series of tragedies, it's getting harder to ignore the conditions in which our clothes are produced. I'm hoping that by stepping back from the temptation of abundant and cheap clothing in the biggest stores, I can re-evaluate the way I shop, and maybe become a better consumer. I've been watching This Old Thing, a new programme on Channel 4 hosted by Dawn O'Porter. It's not really anything groundbreaking, following formulae which were invented by Trinny & Susannah and honed by Gok Wan, but it's really fun and promotes vintage. 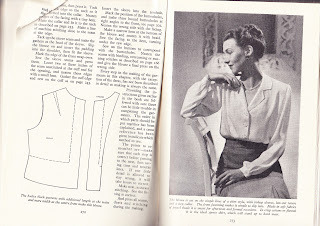 Unlike Dawn, I don't have a team of expert seamsters at my disposal, but I can take inspiration from the show for my challenge of finding vintage gems and making the best of what I already own. 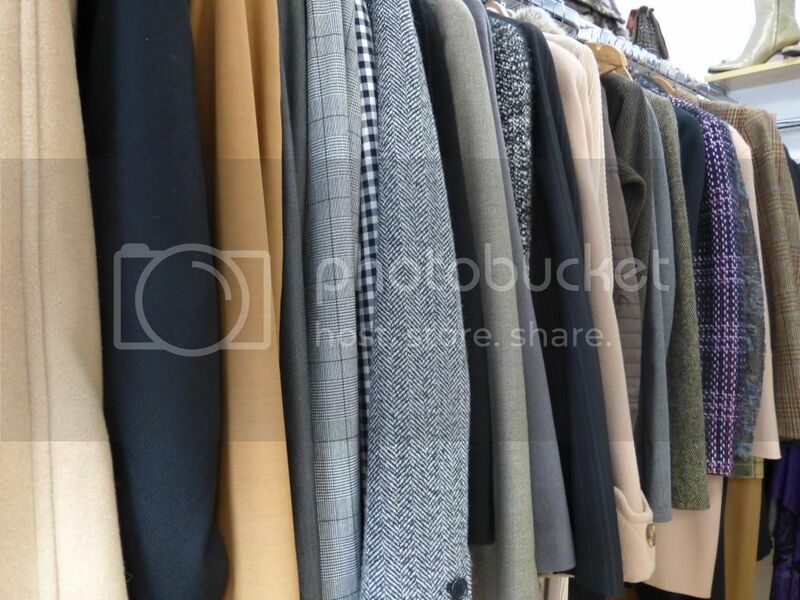 Shopping second-hand is so much more satisfying. 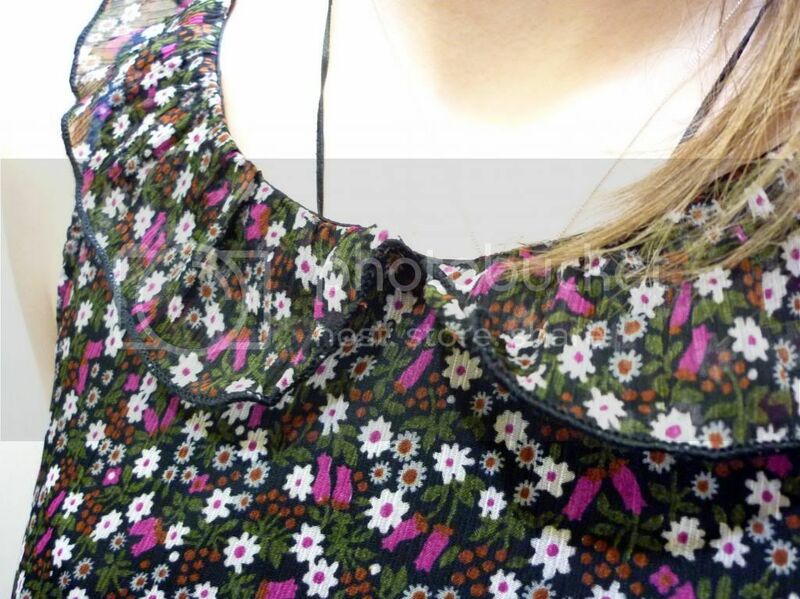 The other day I went into town with a goal: to find a dress which I can wear to an upcoming party for under £10. I also decided to start my search in charity shops. It happened that in the first one I looked in, there was an ideal dress for £8.99. Knowing that there was only one dress like this - rather than a whole rack of them - and that I had found it, was just a fab feeling. The Monday afternoon "I know what I'll do - buy a dress from Primark/Topshop/Miss Selfridge!" sessions really need to stop. I'm not sure how this started, but it's definitely a thing. Once upon a time, this blog was very vintage-focused. I'm not sorry that it moved away from that a bit because I think I would have become too bored with just that one area to blog as much. But I'm kind of looking to go back to my roots here. I mean, even the clothes in the header are outside an antique shop in France, plus my first ever published-in-print article was about places to find vintage clothes. It should be fun to keep my readers updated on how the challenge is going. I'm sure there are some more reasons but those are really the main ones. Anyway, the point is: I'm going to keep going with this for as long as I can. I'm not going to set a particular time-frame because you just don't know when your only good pair of leggings will break, or you'll need a fancy-dress costume, or you'll be invited to meet Prince Harry (it could happen). But let's say, as a vague guide, that I'll be starting pretty much straight away (just as soon as my winter boots from Fat Face arrive...) and trying to stick to this for the next academic year, so until June/July 2015.